Maputo, 27 - 29 June 2017 | A series of three events to identify how the Global Panel’s work can inform Mozambique’s strategic approach to combatting malnutrition in all its forms, by encouraging policymakers to promote healthy diets. Mozambique has made a remarkable transition from a post-conflict country 25 years ago, with substantial improvements in the economy, food availability and access. However, today 43% (1.7 million) children under the age of five are stunted, and 89% of children under 2 years of age do not have a minimum acceptable diet. Vitamin A deficiency and anaemia in children under 5 years of age are also high at 62% and 64%. Around half of women of reproductive age suffer from anaemia and about a quarter have iodine deficiency. Mozambique, like many other countries, also faces future challenges where undernutrition and micronutrient deficiencies will co-exist with emerging rates of obesity and associated diet-related non-communicable diseases. The country also remains vulnerable to environmental shocks. For example during the 2016 drought around 1.5 million people in Mozambique suffered acute food insecurity. Despite the clear political will to tackle malnutrition among government entities, partners and civil society in Mozambique, significant challenges remain with 43% of children under the age of five being stunted due to chronic illness and poor diet. . The Global Panel on Agriculture and Food Systems for Nutrition, together with the Foundation for Community Development Mozambique and the Graça Machel Trust, organised a High Level Roundtable focused on how government, civil society and the private sector might work together at the national, provincial and local level to develop scalable interventions to deliver high quality diets across Mozambique. 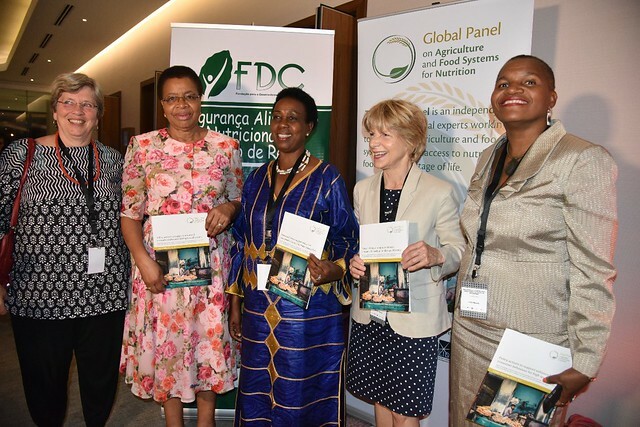 In addition, an event co-hosted with GAIN (Global Alliance for Improved Nutrition) brought together around 50 key figures from the private sector to explore the role of business in promoting healthy diets. The event show-cased several examples of innovative practice and revealed some of the challenges and opportunities to stepping up the sector’s involvement either through the supply of nutritious foods or through the implementation of corporate social responsibility actions. Working with GAIN, the Global Panel will use the outputs from this event to inform a range of work, including a new brief on the private sector, which will be published in November. The events took place in the broader context of the African Union’s Malabo Declaration, which calls for the pursuit of agriculture-led growth as a main strategy to achieve targets on food and nutrition security and shared prosperity, and the realisation of the Sustainable Development Goals which provide a powerful and enabling framework for action and change.